Kaz is the hostess for SDC26, and she is challenging you to use Animals, Insects or Birds on your creation. For this challenge you can use ANY stamp company, as long as you use Animals, Insects or Birds. Kaz is being generous by saying the animal can include birds, bees butterflies or other insects too! To create the BG, smoosh Mustard and RustyHinge ink on craft sheet, spritz with water, smash matte card stock into ink, let dry. Spritz Honeycomb stamp water, stamp randomly onto inked panel, let dry. Randomly stamp Honeycomb image in Rusty Hinge. Stamp Hexagon in Black, add bees in Black. On leftover inked panel, stamp sentiment in Black. Very pretty in the colors you used, luv those stamps! Those are some of my favorite colors! Fabulous card and the bees look so real! 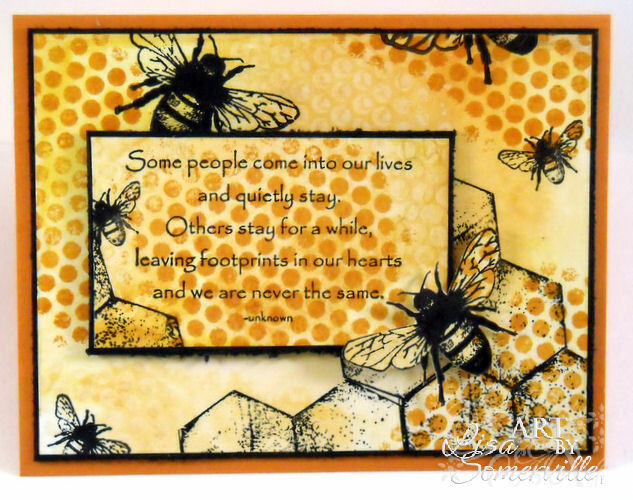 Wonderful card, love the honey comb, the bees, and the sentiment too! 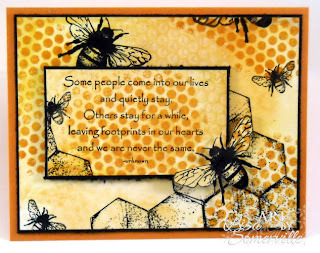 Wonderful use of the bees, honeycomb and and sentiment. Love the popped bee on the sentiment. Wonderful, love the colours and the images.